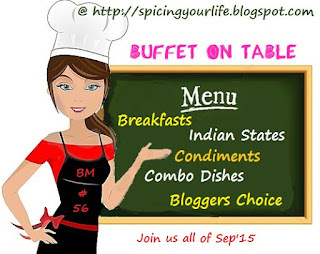 For #Buffet on Table today I have Malaysia… sorry cuisine from Malaysia delicious and yummy . See the cuisine is so delicious that I am gobbling up words. # Roti Jala or Net/Lacy Crepes are deliciously easy to make #Malaysian dish. The name is derived from the Malay words roti (bread) and jala (net). A special ladle with a five-hole perforation used to form its lacy pattern( I used the jelebi maker). #Roti jala is usually eaten as an accompaniment to a curried dish, or served as dessert with a sweet dipping sauce. Served with a Quick Paneer Sambal that was originally from Tofu Sambal from here since we are not keen on Tofu I used Paneer. For non-vegetarians, the Chicken Sambal will be yum. Jala Roti or Net Pancakes are Breakfast or Snack Dish !! Put all ingredients into a blender jug and blend for 2 minutes until smooth. Scrape the sides of the jug once a while to avoid lumps. Place a non-stick pan over a medium heat. Fill the Roti Jala mould (if you have one) I used the Jelabi dispenser with batter and quickly form a lacy pattern over the pan. Move the mould in a circular motion. Leave it for few seconds. Once cooked, turn it over on a plate. (Cook only one side). Fold the crepe into quarters or roll and stack up. Your Roti Jala have turned out so well Archana.They look so pretty.. Even I am in love with these roti jala. It looks fancy but reading the recipe it doesn’t seem as complicate as it looks like. Nice pick and you have captured it beautifully in your camera. Jala looks so beautiful and thanks for stepwise clicks. Beautiful looking roti jalas. Need to try it asap..
Beautiful roti jalas. Need to try asap. Oh these crepes look so pretty..don’t you think we can work on them without eggs..may be difficult , but we must find a substitute. Yes must try using egg replacer. without a mold I tried these using a spider once and they were a total flop. Your came out great! Roti jala has been on my to-make list for a very long time. You are tempting me to try these real soon. Ahh that is soo cute arch! So beautifully done! !